Full bottom hair removal with Organic Sugar. The product we use is called My Sugar, it comes from the USA and it leaves a smooth finish with less pain. 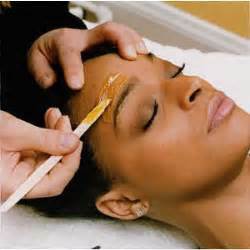 Organic Wax with additional tweezing cleans up the hair around the eyes. Available for both men and women. Organic Sugar and organic cotton fabric strips are used to leave a smooth finish with barely any pain. Male athletes or men with a lot of chest hair look best with a waxed chest. The Organic Sugar product we use keeps pain to a minimum and leaves a smooth finish.